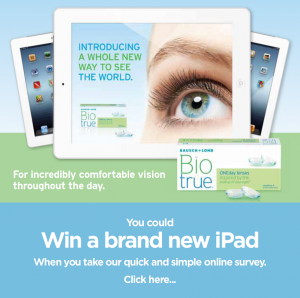 Answer a few questions for your chance to win a brand new Apple iPad. Brought to you by Eye Contact Opticians in Partnerhsip with Bausch & Lomb Biotrue One Day contact lenses. You do not need to have a prescription or wear contact lenses to enter. Just complete a few questions and your name will be entered into the draw. Winners will be announced by telephone before Christmas and will be invited to an award ceremony for presentation.